¶ 3 Leave a comment on paragraph 3 0 Todd Harvey points out that Dylan’s performance of Honey, Just Allow Me One More Chance sounds much like his cover of Jesse Fuller’s “You’re No Good” on the first album. Dylan biographer Robert Shelton also mentions the similarity. ¶ 6 Leave a comment on paragraph 6 0 Henry “Ragtime” Thomas was born in 1874 in Texas. His parents were ex-slaves. His career pre-dates the blues and, according to Paul Oliver in The New Blackwell Guide to the Blues, some of his songs, including Honey, came from the old minstrel/ medicine shows. 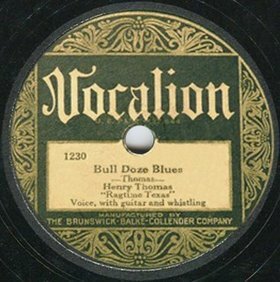 Oliver writes that Thomas is the oldest African-American singer to be recorded. ¶ 7 Leave a comment on paragraph 7 0 Thomas was a songster, meaning he was capable of playing many musical forms, including county tunes, spirituals, popular standards, reels, dance songs, and others. He took up the blues – quite successfully – when that form became popular. ¶ 8 Leave a comment on paragraph 8 0 Interesting trivia: Thomas’s Bull Doze Blues was borrowed by Canned Heat for their hit Going Up the Country. ¶ 9 Leave a comment on paragraph 9 0 Bluegrass greats Flatt and Scruggs covered Honey. ¶ 11 Leave a comment on paragraph 11 0 Scruggs was one of the few country/bluegrass musicians who protested against the Vietnam war. Ah’ll do anything with you. ‘Low me just-a one more chance. So you’ll have to do. Henry Thomas’ Henry Won’t You Allow Me One More Chance’ was NOT included on Harry Smith’s Anthology, only his ‘Fishing Blues’. See Heylin: Revolution In The Air.